B cells play a central role in the immunopathogenesis of glomerulonephritides and transplant rejection. B cells secrete antibodies that contribute to tissue injury via multiple mechanisms. In addition, B cells contribute to disease pathogenesis in autoimmunity and alloimmunity by presenting antigens as well as providing costimulation and cytokines to T cells. B cells also play an immunomodulatory role in regulating the immune response by secreting cytokines that inhibit disease onset and/or progression. B cell–targeted approaches for treating immune diseases of the kidney and other organs have gained significant momentum. However, much remains to be understood about B-cell biology in order to determine the timing, duration, and context of optimal therapeutic response to B cell–targeted approaches. In this review, we discuss the multifaceted roles of B cells as enhancers and regulators of immunity with relevance to kidney disease and transplantation. Historically, immune responses have been classified as cellular or humoral. Cellular responses are mediated by T lymphocytes, which recognize and attack their targets directly or indirectly by enlisting the help of other immune cells, while humoral responses are characterized by the production of antibodies by B lymphocytes and their progeny, plasma cells. These antibodies permeate extracellular spaces, where they protect against infection and also contribute to tissue injury in autoimmunity and transplantation. B cells have therefore traditionally been associated with humoral immunity, but we now know that they are equally critical to cellular immunity. B cells participate in T-cell activation via antigen presentation, costimulation and cytokine production; affect antimicrobial defenses and tissue inflammation; and, importantly, serve as regulatory cells that modulate both cellular and humoral responses. Here, we review the classic humoral and the more recently described cellular functions of B cells, with particular emphasis on their roles in the pathogenesis of GN, transplant rejection, and AKI. Three principal classes of B lymphocytes exist in mice and humans, classified on the basis of their ontogeny and anatomic localization: B1 and B2 B lymphocytes, consisting of the marginal zone (MZ) and follicular (FO) B cells (Figure 1). B1 lymphocytes arise from B1 progenitors in fetal liver and persist as a self-renewing population beyond the neonatal period, with little input from the bone marrow (BM) in adulthood, while B2 lymphocytes develop from transitional 2 (T2) B cells that originate from BM precursors with continued output throughout life (1–4). In mice, B1 B cells predominantly reside in the peritoneal and pleural cavities and produce IgM antibodies directed against so-called thymus- or T-independent antigens, usually carbohydrate or phospholipid antigens present on commensal bacteria. They are called T independent because they do not require T-cell help to elicit antibody production. Such antibodies are polyreactive or polyspecific in that they can bind to both self-antigens and microbial antigens. B-cell lineage subsets and functions. B lymphocytes of all lineages arise from progenitors derived from hematopoietic stem cells (HSCs). Most B1 B lymphocytes develop from B1 progenitors in the fetal liver with little input from bone marrow beyond the perinatal period. B2 B lymphocytes develop from transitional 2 (T2) B cells derived from B-cell progenitors in the bone marrow, with subsequent differentiation into marginal zone (MZ) and follicular (FO) lineages occurring in the spleen. Stronger B-cell receptor (BCR) signals induce Bruton tyrosine kinase (BTK) and support maturation to FO B cells, while weaker BCR signals allow expression of neurogenic locus notch homolog protein 2 (NOTCH2) giving rise to MZ B cells. B lymphocytes of each lineage have distinct and overlapping functions in recognizing antigens via T-independent and T-dependent pathways, production of rapid IgM, and long-lasting IgG antibody responses essential for host defense. A prototypical example of antibodies secreted by B1 B cells are those directed against ABO blood groups, which arise naturally during the first few months of life because of structural similarities between the ABO system and bacterial carbohydrate antigens recognized by B1 B cells (5,6). Natural IgM antibodies secreted by B1 B cells play an important role in maintaining tissue homeostasis because of their ability to bind altered self-antigens, such as those expressed by apoptotic cells in ischemia-induced tissue injury and oxidized LDLs in atherosclerosis (7). In addition to IgM, B1 B cells also produce polyreactive IgA antibodies that contribute to mucosal immunity along with IgA secreted by FO B cells (8). Although the existence of B1 B cells as a distinct lineage in humans has been controversial, B cells expressing CD5 that are the source of poorly glycosylated IgA1 and thought to be B1 B cells are increased in patients with IgA nephropathy and contribute to disease pathogenesis (9–11). MZ B cells develop from transitional B cells after induction of neurogenic locus notch homolog protein 2 (NOTCH2) and engagement of its ligand delta-like 1 on endothelial cells, with subsequent retention within the marginal sinus of the spleen mediated by sphingosine-1-phosphate, integrins lymphocyte function–associated antigen 1, and very late antigen 4 (α4β1-integrin, CD49d/CD29), and cannabinoid receptor 2 (4). MZ B cells express polyreactive B-cell receptor (BCRs), complement receptors (CD21 and CD35), and MHC class 1–like molecule CD1d; they produce polyreactive IgM antibodies that facilitate clearance of blood-borne microorganisms and apoptotic cells (4). Similar to B1 B cells, MZ B cells recognize T-independent carbohydrate and phospholipid antigens, a classic example being the recognition of pneumococcal capsular polysaccharides; thus, the susceptibility of splenectomized individuals to systemic pneumococcal infection (12). Both B1 and MZ B cells constitutively express Toll-like receptors (TLRs) and can readily respond to pathogen-associated or endogenous TLR ligands, with or without antigen recognition via their BCR. Thus, B1 and MZ B cells respond like innate cells in mediating rapid IgM antibody responses (approximately 1–3 days) that bridge the temporal gap in immunity against infections until the emergence of FO B cell–derived IgG antibodies (about 7 days). Unlike B1 B cells, MZ B cells also participate in responses to T-dependent protein antigens by generating high-affinity isotype switched antibodies and transporting complement-bound opsonins onto FO dendritic cells (DCs) in splenic follicles aiding germinal center (GC) reactions (13). MZ B cells thus represent a versatile population in their ability to rapidly generate antibodies via not only T-independent but also T-dependent pathways that were previously attributed solely to FO B cells. Abnormal increases in B1 and MZ B cells are described in murine models as well as in patients with autoimmune diseases, including lupus (3,4,14). Finally, FO B cells, which reside in spleen and lymph nodes, are the conventional B lymphocytes of the adaptive immune system and are the most numerous of all B cell lineages. FO B cells arise from transitional B cells in the spleen through a pathway dependent on Bruton tyrosine kinase induced by BCR-mediated signals (2). Although FO B cells participate in T-independent IgM responses, they are primarily responsible for the generation of long-lasting, high-affinity IgG antibodies with the help of T lymphocytes, critical for classic humoral immunity mediating protection after infection or vaccination. As will be discussed later, FO B cells specific to self-antigens or transplantation antigens also play a key role in the pathogenesis of autoimmune kidney disease and transplant rejection. Because a principal function of B lymphocytes is antibody production, it is important at this point to summarize the salient features of these defense molecules and describe their different isotypes or classes. Antibodies, also known as immunoglobulins, are glycosylated protein molecules present on the surface of B cells (surface immunoglobulins) serving as antigen receptors (BCR), or are secreted into the extracellular space where they can bind and neutralize their target antigens (15). A single antibody molecule consists of four protein chains: two “heavy” and two “light,” linked to each other by disulfide bonds (Figure 2). The N-terminus regions of the heavy and light chains, which collectively make up the antigen-binding site, are where the variability between one antibody molecule and another resides, hence determining specificity. Antibody structure. 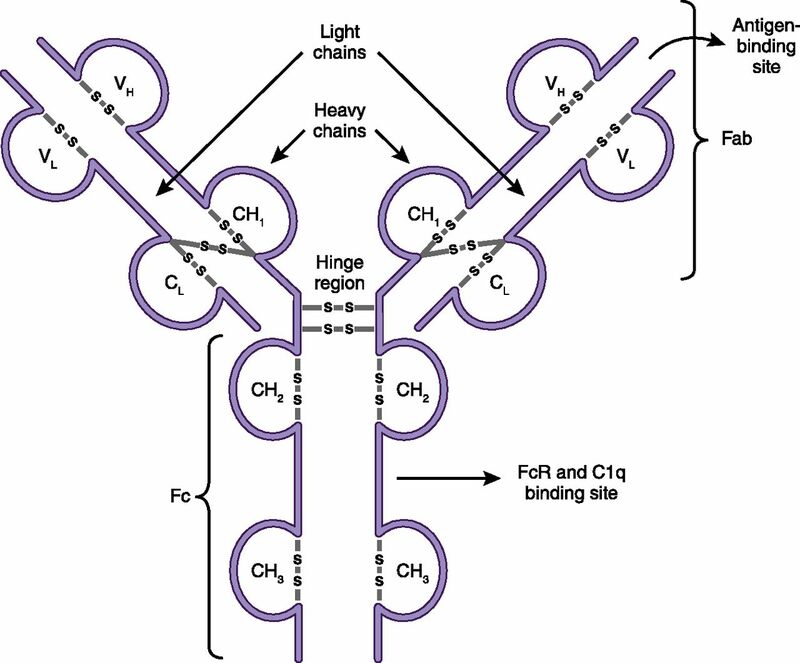 Antibodies (immunoglobulins) are composed of two heavy chains (VH and CH) and two light chains (VL and CL). The antigen-binding fragment, Fab, is composed of one variable domain from each heavy and light chain (VH and VL). The variable domains contain the complementarity determining regions (CDRs) with the most sequence variations and determine antibody specificity. The constant domains CH2 and CH3 of the heavy chain make up the crystallizable fragment, Fc, which mediates effector functions through binding to Fc receptors (FcRs) on cells and to complement (C1q). Five isotypes, or classes, of antibodies (IgM, IgD, IgG, IgA, and IgE) exist, and they are distinguished according to the C-terminus regions of the heavy chains, which are constant and therefore do not participate in antigen binding. Instead, these regions (designated Fc) are important for the effector functions of antibodies, the means by which antibodies eliminate pathogens or alternatively cause tissue injury. In addition, there are four subclasses or isotypes of IgG antibodies (IgG1, IgG2, IgG3, and IgG4). Antibodies exert effector functions in three principal ways: They neutralize their targets (e.g., they bind to a virus and prevent it from entering a cell), they activate macrophages and other immune cells by binding to Fc receptors (FcRs) that recognize the constant regions of specific antibody classes, or they activate the classic pathway of the complement system by binding to C1q (Table 1). Which effector mechanism dominates is determined by the heavy-chain isotype and binding affinities of activating and inhibitory FcR on immune cells. For example, IgM and IgG3 are excellent complement activators, while IgG1 and IgE bind FcR to activate macrophages and mast cells, respectively (15). Pathogenic antibodies in patients with autoimmunity, such as lupus and transplant rejection, are usually IgG, with the isotype influenced by the nature of the antigen (e.g., polysaccharide antigens incite IgG2, whereas protein antigens induce IgG1; Table 1) and concomitant cytokine milieu of the immune response (e.g., IL-4 and IL-21 induce IgG1 and IgG3) (16). Among IgG isotypes, IgG1 and IgG3 bind FcγR most efficiently and also activate complement, contributing to their associated proinflammatory effects. IgG1 is the predominant isotype, constituting 60%–75% of serum IgG and has a longer half-life (3 weeks), providing the basis for the commonly used dosing regimens (every 3–6 weeks) of intravenous immunoglobulin (IVIG) when used as replacement in immunoglobulin deficiencies or treatment of autoimmune diseases. Efficient binding of IgG to its FcγR is influenced by post-translational modifications of the sugar moieties attached to the CH2 domain of the Fc fragment, affecting structural stability and function (17). Differences in glycosylation of antibody molecules due to altered expression of glycosyltransferases are observed in various disease states and contribute to pathogenesis (18). For example, poorly galactosylated IgA1 aggregates form immune complexes with IgG that trigger a cascade of proinflammatory events upon binding to mesangial cells in IgA nephropathy (19); nonfucosylated IgG-Fc, which increases binding to FcγRIIIa and antibody-dependent cellular cytotoxicity, is observed in patients with antiplatelet alloantibodies and controllers of HIV infection (20,21); degalactosylated IgG is found in several autoimmune diseases, suggesting its pathogenicity; and increased terminal sialic acid residues linked to IgG Fc fragment confer potent anti-inflammatory properties of IVIG by binding to DC-specific intercellular adhesion molecule 3–grabbing nonintegrin expressed on macrophage and DC subpopulations, and causing upregulation of the inhibitory FcγRIIb (22–24). In addition to changes in glycosylation, binding affinity to FcR is also influenced by polymorphisms in activating (e.g., FcγRIIIa) and/or inhibitory (e.g., FcγRIIb) FcRs and contributes to pathogenesis in autoimmune diseases such as lupus (25,26). B lymphocytes primarily originate in the BM, except for B1 B cells, which arise from fetal liver as previously discussed (1,3). B lymphocytes develop from common lymphoid progenitors of hematopoietic stem cells, which also give rise to T lymphocytes and natural killer cells with commitment to B-cell lineage being determined by the expression of paired box protein 5 (Pax5) (27). B-cell development progresses through sequential maturation steps within the BM before release of immature B cells into the circulation and subsequent completion of differentiation into mature B cells within the spleen. Developing B cells progress through rearrangement of immunoglobulin heavy- and light-chain gene segments (variable V, diversity D, joining J) from pro-B to pre-B to immature B cells, culminating in the expression of IgM mature BCR on the cell surface that can bind antigens (Figure 3) (28). The maturation steps depend on close interactions between developing B cells and BM stromal cells, which provide critical adhesive integrins, growth factors, chemokines, and cytokines (e.g., Fms-like tyrosine kinase 3, thrombopoietin, C-X-C motif chemokine ligand [CXCL] 12, and IL-7) (27). Immature B cells exiting the BM home to the spleen, where they differentiate into transitional 1 and 2 B cells, which mature into MZ or FO B cells guided by BCR signals, B cell–activating factor (BAFF), and expression of transcription factors, NOTCH2 and BTK (2,4,28). MZ B cells are retained in the spleen while FO B cells recirculate, populating various secondary lymphoid tissues (e.g., lymph nodes, tonsils, and gut-associated lymphoid tissues, such as Peyer patches). B-cell development and mechanisms of self-tolerance. B-cell development begins in the bone marrow and is completed in peripheral lymphoid tissues, such as the spleen. 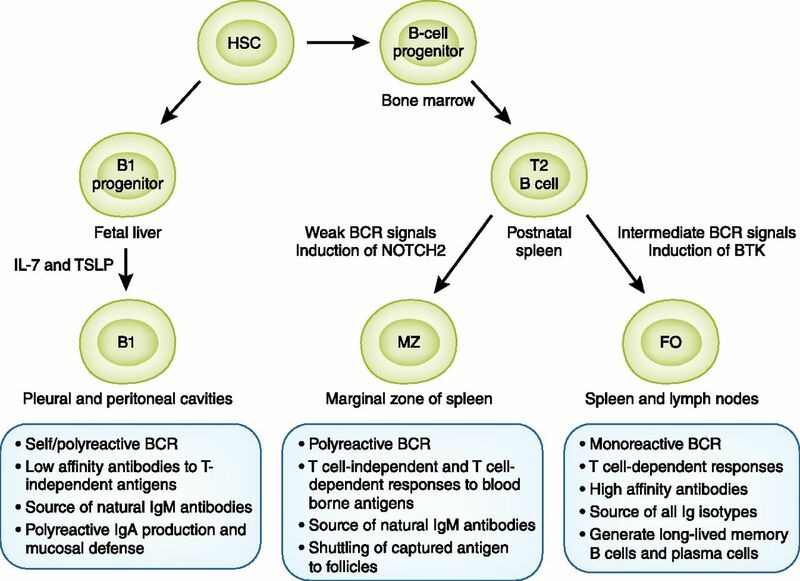 Development in the bone marrow progresses sequentially through pro-B, pre-B, and immature B cell stages and expression of surface IgM, mature B-cell receptor (BCR). Immature B cells with strong reactivity to self-antigen undergo clonal deletion or rearrange their immunoglobulin gene segments; this is called receptor editing, which eliminates self-reactivity and allows entry to the transitional B-cell pool. Transitional B cells depend on B cell–activating factor (BAFF) for survival and differentiate into mature B cells in the spleen. Those transitional 1 and 2 (T1/T2) B cells with strong self-reactivity undergo clonal deletion or remain outside splenic follicles as hyporesponsive anergic B cells that can be rescued upon receiving T cell help to enter the mature B-cell pool. Mature B cells that are activated by foreign antigen and enter germinal center (GC) reactions give rise to isotype-switched memory B cells and plasma cells. During the process of somatic hypermutation (SHM), a few memory B cells acquire self-reactivity due to random immunoglobulin gene rearrangements and persist as IgG+ self-reactive clones in the periphery. The random rearrangement process of immunoglobulin genes during B-cell development ensures the generation of a vast repertoire of BCRs capable of recognizing a huge diversity of antigens. This results in inherent generation of B cells that also recognize various self-antigens. In fact, 75% of immature B cells in humans are estimated to be self-reactive (29). These self-reactive or autoreactive B cells must be eliminated during development to avoid autoimmunity, while still preserving a diverse BCR repertoire in the mature B-cell pool essential for host defense. Developing B cells transit through several selection processes in the BM and spleen that serve as checkpoints in purging autoreactive clones and establishing self-tolerance (28). BCR recognition of self-antigen within the BM and the threshold of generated signals determine selection of immature B cells to move forward to the transitional B-cell stage: positive selection of clones with low-level (also referred to as “tonic”) BCR signals; clones with no BCR signals fail to survive; and clones with strong signals are targeted for apoptosis (clonal deletion, also termed negative selection), unless they rearrange their light-chain immunoglobulin gene segments (termed receptor editing), and re-express a BCR that now meets the threshold for positive selection into the transitional B-cell pool (Figure 3). B-cell repertoire modification of immature B cells that occurs within the BM by clonal deletion and receptor editing is termed central tolerance, and the latter mechanism contributes to elimination of a majority of self-reactive clones (20%–50%). Additional selection mechanisms occurring within the spleen remove the remaining autoreactive clones that recognize peripheral self-antigens: Transitional B cells with strong BCR signals undergo clonal deletion or attain a state of hyporesponsiveness, termed anergy, with shortened survival (1–5 days) (Figure 3) (30). However, these peripheral tolerance mechanisms can be circumvented by elevated levels of BAFF and T-cell help of anergic B cells, enabling autoreactive clones to enter the mature B-cell pool (31). Self-reactive B lymphocytes that escape clonal deletion, receptor editing, or anergy are eliminated by CD4+ T cells via Fas receptor–Fas ligand and CD40–CD40L interactions in addition to being held in check by CD4+ T cells and B cells with regulatory properties (Tregs and Bregs, respectively) (32,33). Failure of one or more of the self-tolerance checkpoints described earlier is central to development of autoimmune diseases, such as lupus, that also affect the kidneys (31). For example, in patients with systemic lupus erythematosus (SLE), defects in BCR signaling due to mutations in BTK or protein tyrosine phosphatase nonreceptor type 22 (PTPN22) gene polymorphism disrupt central tolerance, and elevated serum BAFF levels and Fas receptor–Fas ligand polymorphisms contribute to observed defects in peripheral tolerance (31,34). Despite the absence of autoreactive clones entering the naive B cell pool, following foreign antigen-mediated activation and GC reaction, some IgG+ memory B cells acquire self-reactivity as a consequence of somatic hypermutation that also contribute to autoantibodies in SLE (31). A hallmark of humoral immunity is the generation of long-lived memory B cells and plasma cells that produce high-affinity, isotype-switched antibodies essential for host defense. B-cell activation and differentiation into extrafollicular or GC-driven memory B cells, plasma blasts, or plasma cells are guided by integration of (1) nature of antigen, such as polysaccharide, glycolipid, or protein; (2) associated TLR signals; and (3) cytokine and costimulatory helper signals (35). Polysaccharide and glycolipid antigens are poor activators of T cells, and in general, B1 and MZ B cells responding to these antigens are activated independent of conventional T-cell help. However, unlike FO B cells, B1 and MZ B cells express TLR in their nascent state, which allows them to integrate signals from TLR ligands (such as LPS, Cytosine-phosphate-Guanine DNA, and double-stranded RNA) derived from pathogens or damaged cells, along with antigen recognition, to differentiate rapidly into IgM or isotype-switched short-lived plasma blasts and memory B cells in extrafollicular areas without entering the GC (36). MZ B cells also interact with other helper cells, such as natural killer T cells, neutrophils, and DCs, that provide cytokines (BAFF, a proliferation-inducing ligand [APRIL], IL-21, IL-6, and IL-10) and costimulatory signals (CD40L) within the extrafollicular areas, facilitating limited somatic hypermutation and antibody diversification (36). Thus, B1 and MZ B cells generate predominantly low-affinity IgM or isotype-switched IgG antibodies in extrafollicular areas independent of conventional T-cell help (4). For protein antigens that are recognized primarily by FO B cells, activation is initiated upon antigen recognition by the BCR and critical helper signals derived from antigen-specific CD4 T cells (Figure 4). Upon binding antigen, the BCR sets two key processes in motion. First, it signals to the cell’s interior to trigger essential gene expression programs. Second, it internalizes the antigen and delivers it to endosomal compartments, where it is degraded into peptides that are then bound to MHC-2 molecules and recycled to the surface of the B lymphocyte. These peptide–MHC-2 complexes are what antigen-specific CD4 T cells recognize to establish intimate contacts with B cells and provide them with the help needed for their proliferation and differentiation. Because the CD4 T cell providing help is activated by the same antigen as the B cell, the contact and interaction between these T and B cells is referred to as “cognate” or “linked.” T–B interactions required for B lymphocyte activation are orchestrated not only in time but also in space (37). They take place within secondary lymphoid tissues guided by the expression of chemokine receptors and corresponding ligands (38). Naive B cells, for example, express C-X-C motif chemokine receptor 5 and are retained in clearly delineated areas, called primary lymphoid follicles or B-cell zones, in lymph nodes by CXCL13 from FO DCs (38). After antigen recognition, B cells upregulate C-C chemokine receptor 7 and Epstein-Barr virus–induced receptor to migrate to the boundary of the follicle adjacent to the T-cell zone (referred to as T–B border), where they initiate cognate interactions with early T follicular helper cells (Tfhs) (39,40). T-cell help for B cells comes in the form of costimulatory ligands (CD40L; inducible costimulator ligand) and cytokines (e.g., IL-4, IL-21, and IFN-γ) that stimulate B-cell proliferation and differentiation. B-cell activation and differentiation into memory B cells and plasma cells. B cells that have encountered antigen migrate to the T–B border by upregulating C-C chemokine receptor 7 (CCR7) and Epstein-Barr virus–induced receptor 2 (EBI2), where they first encounter cognate T cells that mature into T follicular helper cells (Tfhs). 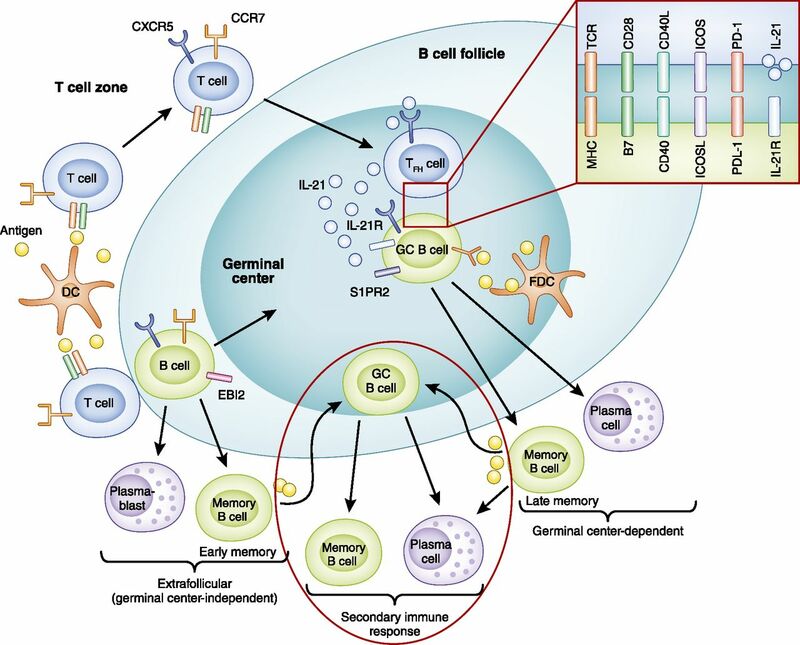 B cells can differentiate into extrafollicular plasma blasts or memory B cells independent of germinal centers (GCs). B cells that express B-cell lymphoma 6 (Bcl6) return to the follicles, where they are retained via sphingosine-1-phosphate receptor 2 (S1PR2) expression to form GCs with Tfhs. Within GCs, B cell–Tfh interactions via MHC 2–T-cell receptor, B7–CD28, CD40–CD40L, inducible costimulator ligand (ICOSL)–inducible costimulator (ICOS), programmed cell death protein ligand 1 (PDL1)–programmed cell death protein 1 (PD1), and IL-21 receptor (IL-21R)–IL-21 facilitate somatic hypermutation and immunoglobulin isotype class-switch recombination (CSR) that generate high-affinity GC-dependent memory B cells and long-lived plasma cells. Following antigen re-exposure, extrafollicular memory B cells now enter GCs to generate isotype-switched and high-affinity secondary memory B cells and plasma cells, while GC-dependent memory B cells can rapidly differentiate into secondary plasma cells or re-enter GC to produce secondary memory B cells and plasma cells. DC, dendritic cell. Some of the activated B cells develop into extrafollicular plasmablasts and early memory B cells without entering the follicles (extrafollicular pathway). Activated B cells that upregulate B-cell lymphoma 6 (Bcl6) return to the follicles (FO pathway), where they are retained by the expression of sphingosine-1-phosphate receptor 2 to form GCs with Tfhs, which support affinity maturation of immunoglobulin antigen–binding sites and immunoglobulin class switching (40,41). Within the GC, IL-21 and costimulatory signals derived from Tfh (Figure 4) sustain extensive B-cell proliferation and induce gene expression programs essential for somatic hypermutation (SHM) and class-switch recombination (CSR) to generate high-affinity class-switched memory B cells and plasma cells (41). SHM and CSR require the expression of the DNA-editing enzyme activation-induced cytidine deaminase: SHM induces point mutations within the immunoglobulin gene segments that encode the variable antigen-binding regions, enabling selection of high-affinity clones into memory and plasma cell pools by competition for antigen within the GC; CSR replaces genes that determine isotype classes, allowing generation of antibodies with different effector functions without changing their antigen specificities (42–44). GC B cells that have successfully acquired Tfh signals and competed for the limited antigen within the GC with high-affinity interactions upregulate Bcl2 family prosurvival factors and are selected into the memory B-cell or plasma cell pools (37,45–47). Productive Tfh interactions with GC B cells initiate sequential expression of transcription factors, IFN regulatory factor 4, B lymphocyte–induced maturation protein 1 (also known as PR domain zinc finger protein 1), and X-box binding protein 1, which commit their differentiation into long-lived plasma cells after repression of Bcl6 (48,49). Blimp1 expression is essential for sustaining plasma cell development via both extrafollicular and FO pathways, while Xbp1 functions to support immunoglobulin secretion (35,50–52). Plasma cells home to the BM via C-X-C motif chemokine receptor 4, where they reside in survival niches supported by stromal cells secreting CXCL12 and cytokines (IL-6; APRIL) and produce antibodies maintaining serologic memory independent of further antigen exposure (35). Memory B cells recirculate and form extrafollicular or FO aggregates in lymphoid tissues, where they differentiate rapidly into plasma blasts (GC-dependent memory) or re-enter GCs upon antigen rechallenge (extrafollicular and GC-dependent memory), resulting in further diversified secondary antibody responses (47,53–56) (Figure 4). Memory B cells and plasma cells generate high-affinity immunoglobulin class-switched diversified antibodies, which are the basis of long-lived humoral immunity and are difficult therapeutic targets in autoimmune diseases. 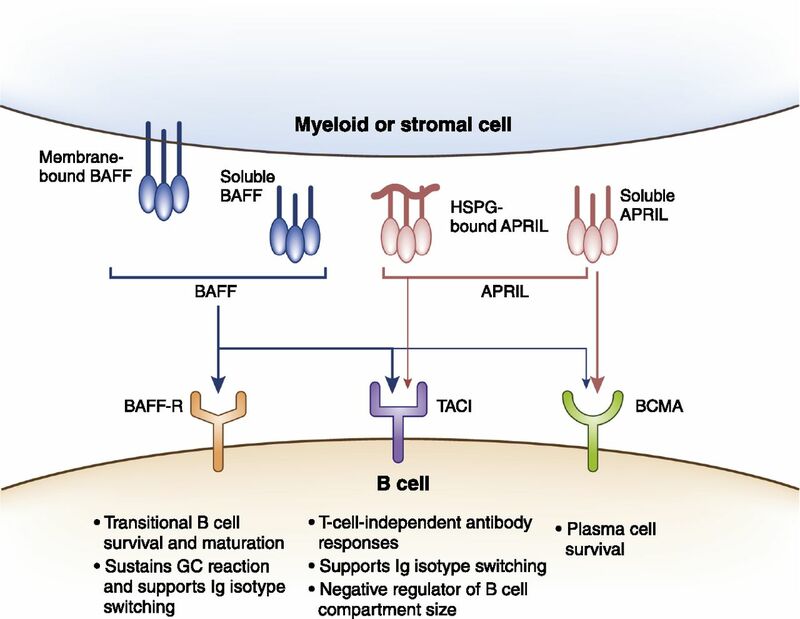 At this juncture, it’s relevant to discuss the two key cytokines, BAFF (also known as B-lymphocyte stimulator) and APRIL of the TNF family, required for survival of B cells during various stages from their initial development to terminal differentiation (Figure 5). BAFF and APRIL are produced by myeloid cells (such as DCs, macrophages, and neutrophils) and stromal cells (57,58) and bind to receptor transmembrane activator and cyclophilin ligand interactor (TACI) and B-cell maturation antigen, while BAFF also signals through B cell–activating factor-receptor (BAFF-R) (Figure 5) (57). BAFF is essential for survival and maturation of transitional B cells, sustains GC reaction, and supports CSR (57,59). Signaling through TACI, both BAFF and APRIL, promote T-independent antibody responses and CSR, while BAFF also functions in limiting B-cell expansion through TACI (57,60). Plasma cell survival requires APRIL and/or BAFF signaling through B-cell maturation antigen, whereas immunoglobulin class-switched memory B cells are maintained independent of BAFF or APRIL (57,61,62). Dysregulation of BAFF is associated with autoimmune diseases, such as SLE and ANCA-associated vasculitis (AAV), and targeting soluble BAFF using belimumab has shown benefit for patients with lupus nephritis (63–65). B cell–activating factor (BAFF), a proliferation-inducing ligand (APRIL), and their receptors. BAFF and APRIL are transmembrane proteins of the TNF family that can be proteolytically cleaved to produce soluble forms. They are produced by myeloid cells, such as dendritic cells (DCs), neutrophils, monocytes, macrophages, and stromal cells. BAFF binds strongly to receptors, B cell–activating factor-receptor (BAFF-R) and transmembrane activator and cyclophilin ligand interactor (TACI), and weakly to B-cell maturation antigen (BCMA), whereas APRIL binds strongly to BCMA and moderately to TACI. APRIL can also exist bound to heparin sulfate proteoglycan (HSPG) in extracellular matrix and interacts with TACI in this form. BAFF promotes survival and maturation of transitional B cells into mature B cells, supports B cell proliferation, class-switch recombination (CSR), and plasma cell survival. APRIL is critical for T-independent responses and supports CSR and survival of plasma cells. In addition to their obvious role in humoral immunity, it is now established that B lymphocytes contribute directly to cellular immunity via at least three mechanisms: (1) they serve as antigen-presenting cells (APCs) that enhance T lymphocyte–mediated immunity; (2) they function as bona fide cellular effectors that produce inflammatory cytokines; and (3) a subgroup of them, known as Bregs characterized by IL-10 secretion, modulate immune responses (Figure 6) (66,67). Moreover, B cells maintain secondary lymphoid organ architecture, particularly of the spleen, and promote the formation of ectopic lymphoid tissues (tertiary lymphoid tissues) at sites of chronic inflammation, which then become hot spots of local T- and B-lymphocyte activation (Figure 6) (68–72). Together, these “cellular” functions of B cells significantly contribute to the pathogenesis of autoimmunity and allograft rejection. Cellular functions of B cells. B cells interact with T cells and innate cells, such as dendritic cells (DCs), via several mechanisms that influence the outcome of the immune response. 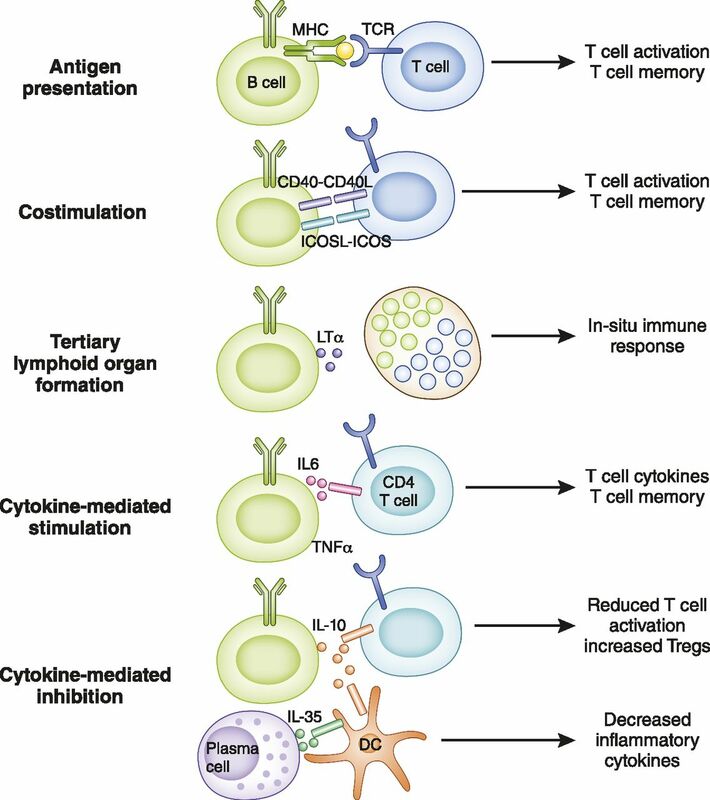 Antigen presentation, costimulation (such as CD40–CD40L, inducible costimulator ligand [ICOSL]–inducible costimulator [ICOS]), and cytokine production (such as IL-6 and TNF-α) contribute to enhanced T-cell activation and differentiation (e.g., T follicular helper cells), cytokine polarization (e.g., Th1 and Th17), and formation of long-lived memory T cells. Lymphotoxin (LTα) produced by B cells contributes to formation of tertiary lymphoid organs in peripheral tissues that are sites of in situ immune responses causing tissue injury. B cells and plasma cells also secrete cytokines, such as IL-10 and IL-35, that reduce T-cell activation and cytokine production and increase T cells with regulatory properties in addition to modulating functions of innate cells, such as DCs (e.g., decreased IL-6 and IL-12), to attenuate immune responses. Antigen captured by the BCR is internalized into endosomal compartments, where it is processed into peptides that then reemerge on the cell surface bound to MHC-1 and -2 molecules. This allows B lymphocytes to present antigenic peptides to both CD4 and CD8 lymphocytes as a “professional” APC (e.g., a DC) would. In addition, and similar to DCs, B cells express the necessary costimulatory molecules and cytokines required for full activation of the T lymphocytes they engage. These include B7 and CD40 molecules, which ligate the T lymphocyte costimulatory receptors CD28 and CD40L, respectively, and the cytokines IL-6 and IFN-γ (73–75). B cells also express innate TLRs, which respond to pathogen-associated molecular patterns, further enhancing their APC function (75–77). Although on a per-cell basis B cells are not as potent APCs as DCs, the fact that they proliferate in response to antigen gives them a clear numeric advantage. Experimental data in mouse models of antimicrobial as well as lupus and antigraft immunity have established that antigen presentation by B cells ensures optimal T-cell activation, cytokine production, and generation of long-lasting memory T cells (73,75,78–82). In the absence of this B-APC function, memory T-cell numbers and function are impaired after an antigenic challenge and organ damage is attenuated in lupus. It is increasingly recognized that during an immune response, some B cells acquire the ability to produce effector cytokines with inflammatory properties (83). Examples of these are IFN-γ, TNF-α, and IL-17 (67,75,84,85). IFN-γ and TNF-α have direct injurious effects on endothelial and epithelial cells, thus contributing to both allograft rejection and inflammatory renal disease (86–89). Similarly, IL-17 stimulates cytokine and chemokine production by endothelia, epithelia, and fibroblasts, which then drive neutrophil infiltration and inflammation (90). Effector cytokines from B cells also influence activation of CD4 T cells, their cytokine production, and memory development (67,75,84,85), likely in a bystander fashion, unlike antigen presentation by B cells, which requires cognate interactions. A regulatory function for B cells has been demonstrated in multiple mouse models of autoimmunity and transplantation, whereby indiscriminate B-cell depletion or deficiency paradoxically caused worsening of disease outcomes (66,91–95). In each case, the regulatory function could be attributed to IL-10 production by a small subset of B cells. Overall, IL-10–producing Bregs constitute about 1% of all B lymphocytes in the mouse and appear to be present in all known major B-cell subpopulations (e.g., FO and MZ B cells) (96). Recent data have shown that T cell immunoglobulin mucin 1 (TIM-1), a member of the T immunoglobulin and mucin domain family of proteins, serves as an inclusive marker for Breg (about 6%–8% of all B lymphocytes in the mouse express TIM-1 and about 30% of these produce IL-10) (96). A monoclonal antibody binding TIM-1 enhances allograft survival in a Breg-dependent manner. In addition to B cells, some plasmablasts (IgM+CD138+) exert regulatory functions via production of the cytokine IL-35 (97). Via IL-10 or IL-35, Bregs modulate innate cells, such as DCs, macrophages, or natural killer cells (e.g., decreased IL-6 and IL-12), decrease inflammatory T-cell cytokines, and increase regulatory Tregs, curtailing the ongoing immune response (95,97–101). Bregs have also been identified in humans, specifically in the CD24highCD38high transitional and CD24highCD27+ memory B-cell subsets, and their numbers correlate with better renal transplant outcomes (102–104). Altered numbers and/or function of Bregs have been described in SLE and AAV, contributing to disease pathogenesis and/or relapse (102,105–107). The presence of potent Bregs could explain why pan-depletion of B cells in humans using anti-CD20 (rituximab) has led to paradoxical or unsatisfactory clinical results in renal transplantation, as well as autoimmune renal disease (108,109). Similarly, indiscriminate use of antibodies targeting BAFF could be detrimental because Breg development and IL-10 production appear to depend on BAFF signaling through TACI (110,111). Selective agents that spare or enhance Bregs are therefore greatly needed to optimize B cell–targeting therapies. Interest in B lymphocytes and antibodies as causative agents in transplant rejection stems from the beginnings of renal transplantation, when it was realized that patients with preformed antibodies against donor antigens reject their grafts within minutes to hours after transplantation (so-called hyperacute rejection) (112). Preformed antibodies that cause hyperacute rejection are those against the ABO blood antigens or HLA. Careful ABO matching of donors and recipients and careful testing of the recipient’s serum for antibodies against the donor’s HLA before transplantation have eliminated hyperacute rejection in the clinic. However, the dilemma of what to do with prospective renal transplant recipients on the waiting list who are highly sensitized to the general population (i.e., those with high panel-reactive antibodies) remained, many of them dying before a suitable donor could be identified. Strategies have therefore been devised to desensitize such patients, allowing them to receive a deceased- or living-donor kidney once their antidonor antibody titers had subsided. Successful strategies include the use of plasmapheresis and IVIG, the latter likely exerting its effects via Fc receptors by downmodulating B-cell function and Fab-mediated effects on target cells (23). Of note, ABO-incompatible heart transplantation, and possibly other organ transplantation, is feasible in infants before the development of significant anti-ABO antibody titers (113). Transplanted infants in fact acquire tolerance to the incompatible ABO antigen, providing firm proof that human B cells are prone to tolerance if challenged while the immune system is still relatively immature (114). More recently, the significance of donor-specific antibodies (DSAs) that arise after transplantation has come to the fore. These antibodies, usually against donor HLA but sometimes directed against non-HLA epitopes, are associated with poor renal allograft outcomes because of acute or chronic antibody-mediated rejection (AMR) (115–119). AMR is often associated with acute or chronic cellular rejection and the presence of DSAs also correlates with increased risk of isolated cellular rejection, indicating that DSAs are a useful biomarker for heightened antidonor immunity (120–124). Strategies to combat the development of DSA have largely relied on the use of adequate T-lymphocyte immunosuppression, such as with tacrolimus, because pathophysiologic antidonor antibodies belong to T cell–dependent isotypes, usually complement-fixing (for example, IgG3) and the requisite role of T-cell help for B-cell differentiation. B-cell depletion with rituximab has been attempted as a prophylactic therapy at the time of renal transplantation (induction therapy) to improve graft outcomes or as a treatment for AMR (125–127). In the former case, it was paradoxically associated with increased, rather than decreased, risk of acute rejection and in the latter the results have been ambiguous (108,127). These clinical studies highlight the heterogeneity of targeted B-lymphocyte populations (memory B cells, plasma cells) and functions (effector versus regulatory) and therefore the need to devise more selective depletional approaches. In addition, dysregulation of BAFF levels, especially after depletion of cells consuming BAFF, contribute to pathogenic antibody responses, indicating that pan-depletion of B cells can have deleterious effects on disease progression (128–131). Long-lived plasma cells lack CD20, the target of rituximab, and account for alloantibody production even after mature B cells that express CD20 are depleted. Targeting plasma cells using proteasome inhibitors alone has limited efficacy, likely due to rapid differentiation of memory B cells into plasma cells to repopulate depleted niches, underscoring the challenges in efficacious removal of pathogenic B cells (132). Data emerging from experimental models and humans strongly suggest that B cells contribute to rejection independently of their antibody-producing role. In mice, B cells promote both acute and chronic rejection by functioning as APCs, and B-lymphocyte participation in the pathogenesis of chronic rejection can occur in the absence of secreted antibody (80,133). A recent study in human renal allograft recipients provided compelling evidence that although activation of B cells resulted in production of both TNF-α and IL-10, it was the relative abundance of TNF-α to IL-10 expression in transitional B cells that correlated strongly with acute rejection and 3-year graft outcomes (104). Patients with stable renal allograft function had similar numbers of transitional B lymphocytes and similar IL-10–to–TNF-α ratios as healthy individuals, while those with graft dysfunction had reduced transitional B-lymphocyte numbers and reduced IL-10–to–TNF-α ratios. B-lymphocyte clusters have also been observed within renal allografts undergoing acute and chronic rejection, contributing to local immune response and causing graft injury (134–137). Together, these findings underscore the importance of the cellular functions of B cells, whether regulatory or effector, in shaping renal allograft outcomes (Figure 7). B cells as enhancers and regulators of immunity in kidney disease and transplantation. B cells can promote or inhibit immune responses, mediating kidney injury, GN, and transplant rejection by various mechanisms of action, and the balance between these functions influences disease outcomes. Isotype-switched antibodies contribute to antibody-mediated rejection (AMR) and GN (e.g., lupus, IgA nephropathy, ANCA-associated vasculitis [AAV]) by forming immune complexes and activating FcγR while natural IgM antileukocyte antibodies are protective in ischemia-reperfusion injury (IRI). Antibody-independent functions of B cells contribute to lupus and ischemia-reperfusion injury and mediate graft rejection by presenting antigen and driving T-cell activation. B cells form tertiary lymphoid structures that are the sites of local immune responses causing tissue injury in lupus nephritis, AAV, idiopathic membranous nephropathy (IMN) and graft rejection. Various B-cell populations with regulatory functions (e.g., IL-10) contribute to graft survival and GN remission (e.g., AAV), and their disrupted numbers or function are observed in transplant rejection and GN relapse (e.g., AAV and lupus). The role of B cells in renal transplantation tolerance has also been an intense area of study. Several independent reports provided evidence that operationally tolerant kidney transplant recipients (those who have stable graft function in the absence of all pharmacologic immunosuppression) exhibit various B-cell alterations within their peripheral blood mononuclear cells, including increased B-cell numbers, B cell–specific gene expression, transitional B cells producing IL-10, memory B cells with an inhibitory phenotype, and granzyme B–expressing B cells that curtail proliferation and cause apoptosis of CD4 effector T cells (138–142). These studies provide the impetus to explore new strategies to induce or enhance regulatory B cells in humans for the purpose of achieving tolerance or minimizing long-term, conventional immunosuppression after kidney transplantation. B lymphocytes are incriminated in the pathogenesis of both systemic and kidney-targeted autoimmune diseases (Figure 7). They are responsible for the generation of autoantibodies and circulating immune complexes that deposit in the kidney and cause GN. As discussed previously, they can also contribute to tissue injury by producing inflammatory cytokines and by presenting antigen to T lymphocytes. The significance of B lymphocytes in human GN can be best inferred from studies that correlate circulating or renal interstitial B cell phenotype and function with disease activity and from studies that attempted B-lymphocyte depletion or inhibition to treat the disease. These include SLE, AAV, Henoch-Schönlein purpura (HSP), cryoglobulinemia, and idiopathic membranous nephropathy (IMN). SLE results from systemic loss of B-cell tolerance, leading to production of high titers of autoantibodies against double-stranded DNA (dsDNA), RNA, and nuclear proteins (143–145). Dysregulated BAFF levels and augmented signal transduction downstream of the BCR, specifically in the BtK-Lyn-Syk kinase pathway, contribute to increased B-cell activation with increased frequencies of memory and plasma cells in patients with SLE (65,131,144,146–148). The presence of anti-dsDNA antibodies identifies patients at risk of lupus nephritis, consistent with experimental evidence that these antibodies have a causative role in GN when deposited as immune complexes in the kidney. However, B cell–deficient but not antibody-deficient mice are protected from lupus nephritis, indicating that cellular functions of B cells also contribute to disease pathogenesis (149,150). In addition to glomerular lesions, lupus nephritis is characterized by inflammation and scarring of the renal interstitium, which predicts progression to renal failure. Recent studies on human renal biopsy specimens have established the presence of conspicuous interstitial B lymphocyte infiltrates in lupus nephritis (151,152). These are often organized along with T cells and DCs into lymph node–like structures that are known as tertiary lymphoid tissues (151,153,154). B lymphocytes within these structures are actively dividing (supported by local BAFF and APRIL), are undergoing somatic hypermutation, and sometimes form germinal centers (151,153–155). The presence of germinal centers is strongly associated with tubular basement membrane immune complexes, providing a highly plausible link between local B-lymphocyte activation and progression of lupus nephritis in humans (151,153,154). On the basis of the causal relationship between B-lymphocyte activation and SLE, B lymphocyte–targeting therapies have been tested in the clinic in patients with SLE who have or do not have lupus nephritis. First tested were the monoclonal anti-CD20 antibodies, rituximab and ocrelizumab, which target the B-lymphocyte surface molecule CD20 expressed on mature B cells, causing depletion of these cells. Two large randomized phase 3 trials failed to demonstrate statistically significant superiority of B-cell depletion with either agent over standard-of-care therapy in patients with active proliferative lupus nephritis (156,157). However, a trend toward more patients reaching complete or partial remission at 1 year (primary endpoint), and improved proteinuria and renal function (secondary endpoints) was observed in the B-lymphocyte depletion groups (109,156,157). Patients treated for class 3 lupus nephritis attained complete remission most successfully, while those with class 5 lupus nephritis were the least likely to respond (109). It is unclear whether adjunct therapies, such as those also targeting T cells, would improve response rates because T cells can contribute to B-cell activation and mediate tissue damage in SLE (158). Favorable outcomes with rituximab treatment were associated with attaining complete B-cell depletion, reconstitution of predominantly naive and immature B cells, and sustained suppression of memory B cells and plasma cells, whereas changes in anti-dsDNA antibodies did not correlate with response (159–161). Development of antichimeric antibodies against rituximab and elevated BAFF levels with poor B-cell repopulation were associated with lack of response (109,130,162). Belimumab is a monoclonal IgG1 humanized antibody against soluble BAFF and is the first biologic therapy to be approved by the US Food and Drug Administration for SLE in 50 years. Depletion of B cells by BAFF deprivation using belimumab normalized complement levels and reduced dsDNA titers and SLE severity in two phase 3 randomized clinical trials (163). Post hoc analysis of the trial data demonstrated improvement in renal flare rates and reduction in proteinuria with anti-BAFF, with greatest benefit in those with high disease activity, suggesting efficacy in lupus nephritis, while serologic memory to past vaccine immunizations was preserved (163–165). It remains to be examined whether the beneficial effects of anti-BAFF in lupus are due to resetting aberrant checkpoints of peripheral B-cell tolerance eliminating autoreactive clones and/or attenuating T-cell activation by blocking costimulatory functions of BAFF (65,166). In contrast to anti-BAFF, treatment with atacicept, a recombinant fusion protein that blocks both BAFF (membrane-bound and soluble) and APRIL, led to severe hypogammaglobulinemia with serious infections and worsening proteinuria when given with mycophenolate mofetil in lupus nephritis (60). Taken together, these studies confirm the key requirement for APRIL and not BAFF in maintaining serologic memory (60,165). Small molecule inhibitors of Btk and Syk have shown early promise in mouse models of lupus nephritis and await examination of efficacy in patients with lupus nephritis (167). 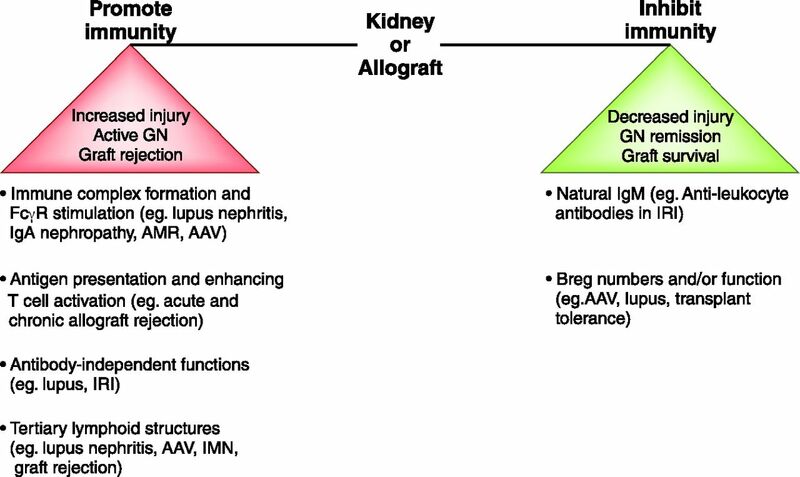 AAV comprises systemic syndromes characterized by necrotizing inflammation of blood vessels; the most significant clinicopathologic manifestation in the kidney is rapidly progressive GN (168). AAV is characterized by circulating ANCA, the principal targets of which are proteinase 3 and myeloperoxidase present in neutrophils and monocytes. In mouse models, the transfer of antimyeloperoxidase antibodies or B cells from affected animals transfers disease to healthy animals (169). In humans, B-lymphocyte clusters have been observed in rapidly progressive GN kidneys, similar to those described in lupus nephritis (170). Aberrations in circulating B cells have been described in patients with active disease in AAV with increased BCR signaling, altered proportions of CD5+ B cells, and decreased Breg numbers or function (105–107,171). Not surprisingly, therefore, rituximab in combination with corticosteroids is an effective (and Food and Drug Administration–approved) therapy for inducing remission in patients with AAV, but its efficacy in treating patients with advanced renal disease has not been established yet (172). Rituximab has also been successfully used to treat relapsing or refractory AAV and to maintain remission, and neither extent of B-cell depletion nor ANCA titers correlate consistently with response (173). The observation that circulating levels of BAFF correlate with disease activity has prompted an ongoing phase 3 trial to test belimumab combined with azathioprine in the maintenance of remission in patients with AAV (63,173–175). Recent studies suggest an inverse relationship between circulating Bregs in the peripheral blood and disease activity or relapse in patients with AAV, highlighting the need to better understand the role of these important regulatory cells in controlling autoimmunity (105–107,171). HSP represents a spectrum of IgA nephropathy with multiorgan involvement and vasculitis of small vessels. Immune complexes formed with aberrantly glycosylated IgA1 cause vasculitis that affects the kidney in approximately 50% of patients with HSP, with similar renal lesions as in IgA nephropathy. CD5-expressing B1 B cells are increased in patients with IgA nephropathy and are the source of galactose-deficient IgA, which contributes to disease pathogenesis (9). Although anecdotal reports have shown a significant response to rituximab in patients with HSP who did not respond to conventional therapy, further studies are needed to examine the use of B-cell depletion in treating HSP (176–178). Polyclonal IgG with or without monoclonal IgM forms immune complex deposits, causing vasculitis and renal disease in patients with mixed cryoglobulinemia. Hepatitis C virus (HCV) infection is the main cause of mixed cryoglobulinemic vasculitis, and the most common renal lesion is membranoproliferative GN. HCV-related MZ B-cell expansion and aberrant activation-induced cytidine deaminase expression sustains B-cell activation and immunoglobulin production (179,180). Rituximab treatment of HCV-associated mixed cryoglobulinemic vasculitis is superior to conventional therapy, supporting a key role for B cells in disease pathogenesis (181,182). Subepithelial deposition of IgG in the glomerular capillary wall is a hallmark of idiopathic membranous nephropathy and, along with the presence of B cells in renal biopsy specimens, implicates B lymphocytes in the pathogenesis of the disease (183). Moreover, approximately 80% of patients have antibodies against the podocyte-derived antigen, phospholipase A2 receptor (PLA2R) (184). Circulating levels of anti-PLA2R antibodies are a biomarker for disease activity and response to treatment (185). Single-arm studies suggest a role for rituximab in treating idiopathic membranous nephropathy; however, responses are detected in only about 60% of patients, with others progressing to ESRD (186). An ongoing phase 3 randomized trial is comparing efficacy of rituximab to cyclosporine in inducing long-term remission in idiopathic membranous nephropathy (187). Results of another phase 2 open-label clinical trial testing the efficacy of belimumab in PLA2R autoantibody-positive idiopathic membranous nephropathy on remission of proteinuria and autoantibodies are awaited (ClinicalTrials.gov NCT01610492). An important need is development of immunologic or other biomarkers to help identify patients who are likely to successfully respond to B-lymphocyte depletion. It is increasingly recognized that immune cells play an important role in the pathogenesis of AKI caused by sepsis, ischemia, or toxins. Recent studies identify the contribution of B cells and antibodies in renal ischemia-reperfusion injury (IRI). Following IRI, B cells infiltrate the kidney and interfere with the repair phase, and in their absence injury is attenuated with increased tubular proliferation (188,189). Conversely, adoptive transfer of serum recapitulated renal injury and transfer of B cells worsened tubular atrophy (188,189). B1 B cells infiltrated kidneys undergoing IRI, and reduction of peritoneal B cells only partially attenuated IRI; this finding suggests that other B-cell lineages, such as FO and MZ B cells, could also contribute to injury (189,190). Natural IgM enriched in antileukocyte autoantibodies protected against IRI by markedly attenuating leukocyte infiltration and activation of pathogenic T cells (191). Thus, early antibodies produced by B cells, such as natural IgM, play a protective role, while their later antibody responses and/or cellular functions could be pathogenic in IRI. B cells link the innate and adaptive arms of immune response by their ability to respond rapidly to damage-associated molecular patterns and antigenic stimuli, and also form long-lived serologic memory. B cells perform diverse functions, such as antibody secretion, cytokine production, antigen presentation, and lymphoid architecture organization, that intersect with both innate (such as DCs) and adaptive T-cell roles in shaping the outcome of the immune response toward immunity or tolerance (Figures 6 and 7). Disruption of B-cell tolerance by cell-intrinsic (BCR signaling) or cell-extrinsic (BAFF, T-cell help) defects, dysregulated BAFF levels, and impaired regulatory functions contribute to pathogenesis of autoimmunity. Depleting B cells could therefore potentially re-establish B-cell tolerance by purging autoreactive clones, eliminate pathogenic antibody-producing B cells, and interrupt cellular functions of B cells that enhance pathogenic T cell activation. However, nonselective pan-depletion of B cells can also remove the beneficial Bregs, increase BAFF levels, and potentially worsen disease. Instead, targeting B cells to correct specific defects or remove pathogenic B cells while sparing others would prevent undesired immune activation or immune deficiency. Future studies aimed at disease-specific understanding of how pathogenic B cells arise could facilitate not only the development of novel selective therapies but also the optimal use of existing therapies, such as rituximab and belimumab, for best outcomes. This work was supported by funds from National Institutes of Health grant R01 AI079177 (G.C.). Ng Y, Oberbarnscheidt M, Chandramoorthy H, Hoffman R, Chalasani G: B cells help alloreactive T cells differentiate into memory T cells. Am J Transplant 10: 1970–1980, 2010. Ishii D, Schenk AD, Baba S, Fairchild RL: Role of TNFalpha in early chemokine production and leukocyte infiltration into heart allografts. Am J Transplant 10: 59–68, 2010. Mengel M, Sis B, Haas M, Colvin RB, Halloran PF, Racusen LC, Solez K, Cendales L, Demetris AJ, Drachenberg CB, Farver CF, Rodriguez ER, Wallace WD, Glotz D: Banff 2011 Meeting report: New concepts in antibody-mediated rejection. Am J Transplant 12: 563–570, 2012. Thibault-Espitia A, Foucher Y, Danger R, Migone T, Pallier A, Castagnet S, G-Gueguen C, Devys A, C-Gautier A, Giral M, Soulillou JP, Brouard S: BAFF and BAFF-R levels are associated with risk of long-term kidney graft dysfunction and development of donor-specific antibodies. Am J Transplant 12: 2754–2762, 2012. Raghavan R, Jeroudi A, Achkar K, Gaber AO, Patel SJ, Abdellatif A: Bortezomib in kidney transplantation. J Transplant 2010: 698594, 2010. Brouard S, Puig-Pey I, Lozano JJ, Pallier A, Braud C, Giral M, Guillet M, Londono MC, Oppenheimer F, Campistol JM, Soulillou JP, Sanchez-Fueyo A: Comparative transcriptional and phenotypic peripheral blood analysis of kidney recipients under cyclosporin a or sirolimus monotherapy. Am J Transplant 10: 2604–2614, 2010. Chesneau M, Pallier A, Braza F, Lacombe G, Le Gallou S, Baron D, Giral M, Danger R, Guerif P, Aubert-Wastiaux H, Neel A, Michel L, Laplaud DA, Degauque N, Soulillou JP, Tarte K, Brouard S: Unique B cell differentiation profile in tolerant kidney transplant patients. Am J Transplant 14: 144–155, 2014.